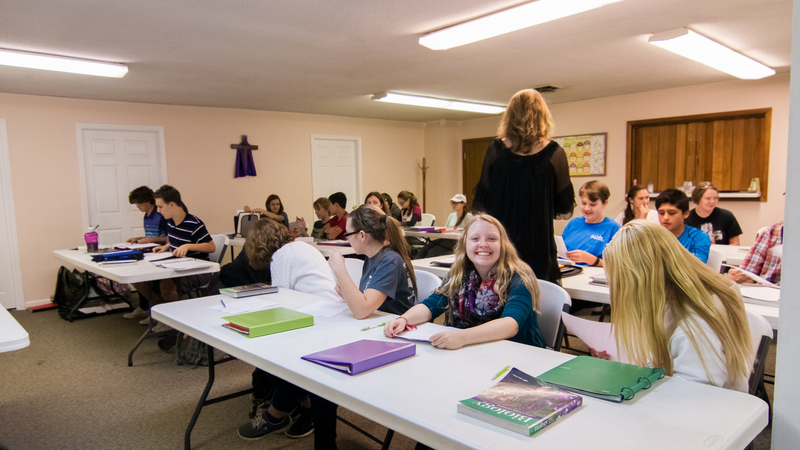 We are a distinctly Christian tutorial program providing quality educational classes from a Biblical perspective for children of Christian families. Hilger Higher Learning is led by an administration and qualified teachers committed to supporting your child’s education through a variety of homeschool classes in Chattanooga. Over half of Hilger Higher Learning’s faculty and staff have over 10 years of teaching and administration experience at Hilger Higher Learning! In addition, our faculty and staff have well over 250 years of combined teaching and administration experience, both in the private/public school sector and at Hilger Higher Learning. While a few small co-ops existed in the mid to late 1990s, Hilger Higher Learning was the first tutorial program to start in Chattanooga, and we’ve been joyfully serving the Chattanooga homeschool community for 21 years. We provide weekly accountability of assigned and turned in homework, teacher feedback and graded assignments, plus tests/quizzes being taken in the classroom, graded and handed back with comments. Our experienced approach, combined with first-rate curriculum and teacher led accountability, helps students get the most out of the class (or classes) they take with us. Furthermore, you can choose one or more classes based on your needs and preferences, and are not bound to an all-inclusive program. To summarize, our combination of wonderful students from Christian homes, excellent teachers, first-rate curriculum, and a variety of activities (inside and outside of the classroom) has created a dynamic environment that helps students not only academically and spiritually, but balances them socially as well. Although the parent is not the teacher of the classes we offer, the parent maintains authority over their child’s learning and is responsible for holding their child accountable for completed assignments and preparing for tests/quizzes/labs. Our teachers simply serve as a support cast for the parents who have chosen to educate their child through the home. As we’ve grown over the years, we’ve received immeasurable feedback on how value-based our classes are – the benefit it provides for the price you pay – and how it’s worth every penny. If you take some time to read about our program and peruse our Faculty page, you’ll notice an abundance of incredibly qualified teachers and staff, who have been with us for a decade or longer! You’ll see that our classes span 34-35 weeks of in-classroom educational material, unlike most other Chattanooga tutorial programs or co-ops that offer less weeks of instruction. Further, and as stated above, we provide weekly accountability of assigned and turned in homework, teacher feedback and grading on assignments, plus tests/quizzes being taken in the classroom, graded and handed back with comments. Even more, you’ll also see an array of extracurricular activities we coordinate in order to encourage social interaction and the use of talent: helpful conferences, field trips, drama productions and choir performances to name a few. On designated years, we even offer our older high school students mission trip opportunities, with faculty and staff serving as team leaders. All of these things have helped us have an extremely high retention rate with former and current families.